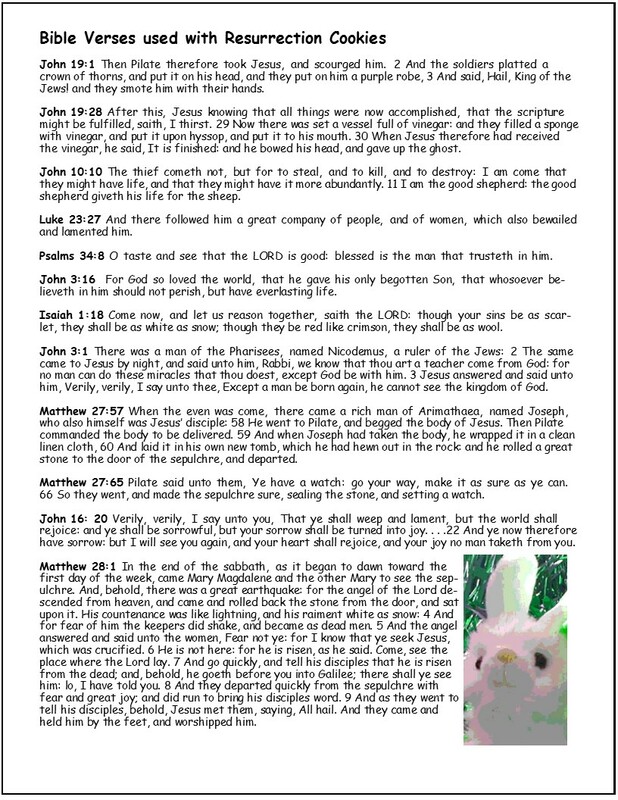 Later in this article is the text for the handouts, including the introduction, recipe, and Bible verses if you choose to create your own verses of the handouts or if you want to put the material on your website or in a church newsletter. You have my permission to use it freely. The text is the same for all of them—choose a style that suits you best or use the text below to create your own version. 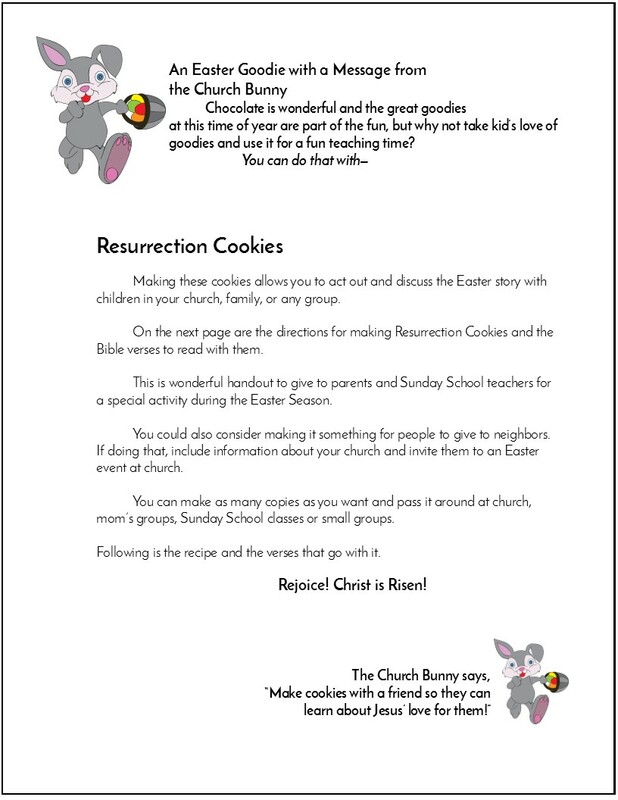 Making these cookies gives you the opportunity to act out and discuss the Easter story, with a focus on Jesus death and resurrection with children in your church, family, or any group. Making them can also be a wonderful project for neighbors who may be unchurched. 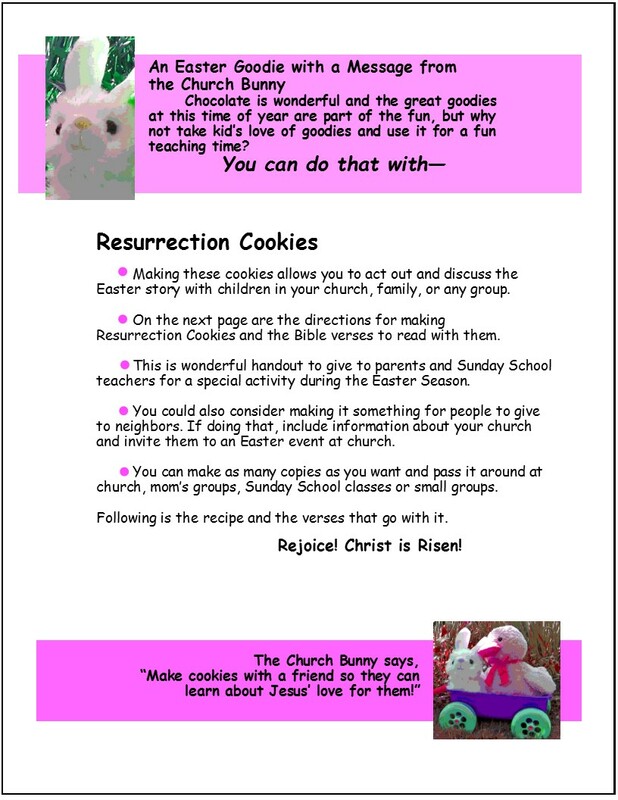 Every child loves goodies, but making Resurrection Cookies gives you an opportunity to share the true Easter story. 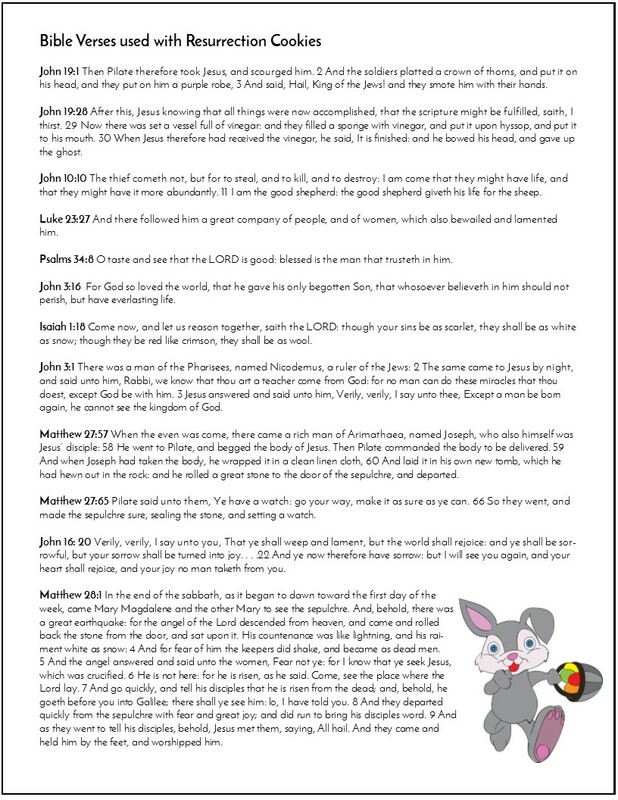 Many children really do not know that Easter is about Jesus instead of bunnies. 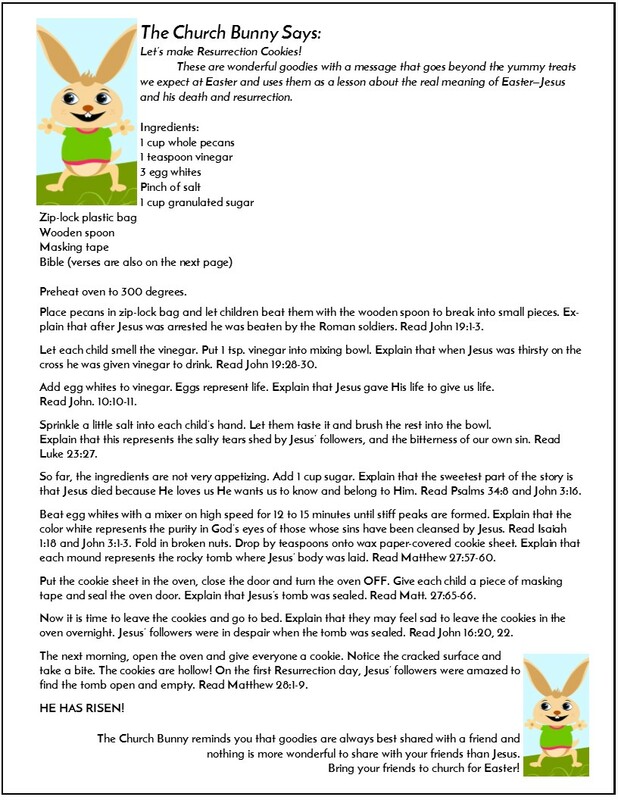 Making these cookies can be a way to introduce them to the true Easter story in a non-threatening way. The cookies share the entire story of Jesus because as you make these meringue cookies, you start with Jesus' trial. You illustrate how he was mistreated when you break up the nuts and add vinegar to the recipe. The process continues with each step of adding an ingredient or preparing the cookie mixture illustrating what happened. With each action, there is also a Bible verse or two that you read along with it. After all the preparation is done, you put the cookies into a hot oven, turn off the heat, and seal the door. This is a picture of Jesus being placed in the tomb. In the morning you open the oven and when you bite into a cookie it is empty! Just like the tomb was on Easter morning. 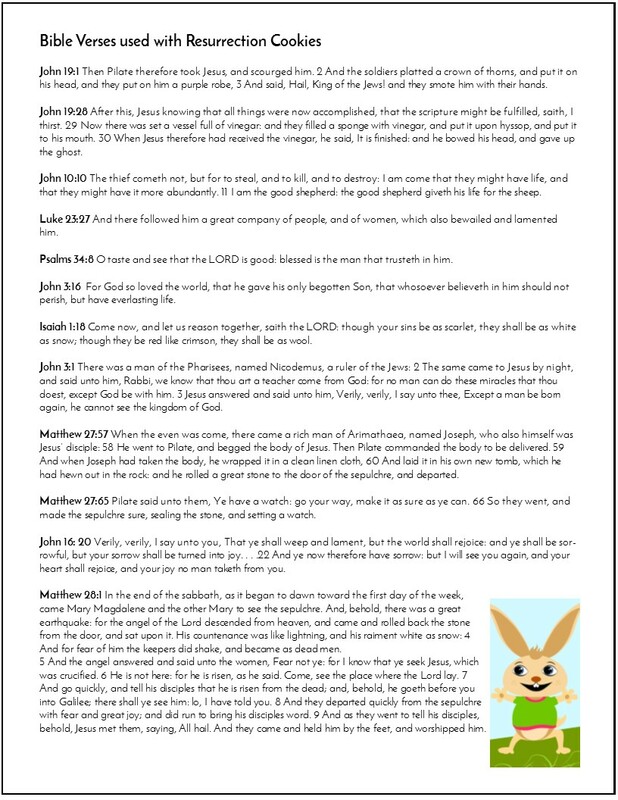 This is a wonderful handout to give to parents and Sunday School teachers for a special activity during the Easter Season. You could also consider making up extra copies as a handout for people to give to their neighbors. If you do that, include information about your church and invite them to an Easter event at church. Chocolate is wonderful and the great goodies at this time of year are part of the fun, but why not take children’s love of goodies and use it for a teaching moment? 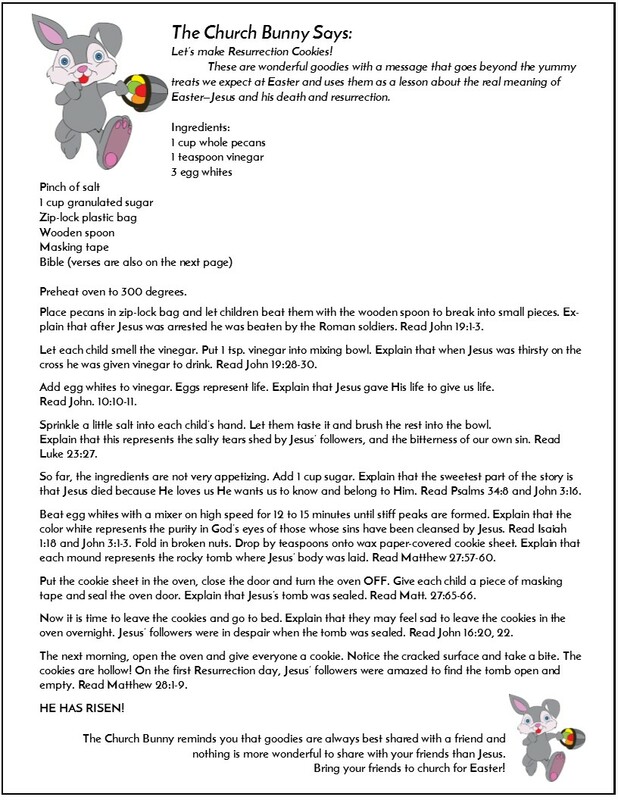 Making these cookies allows you to act out and discuss the Easter story with children in your church, family, or any group. 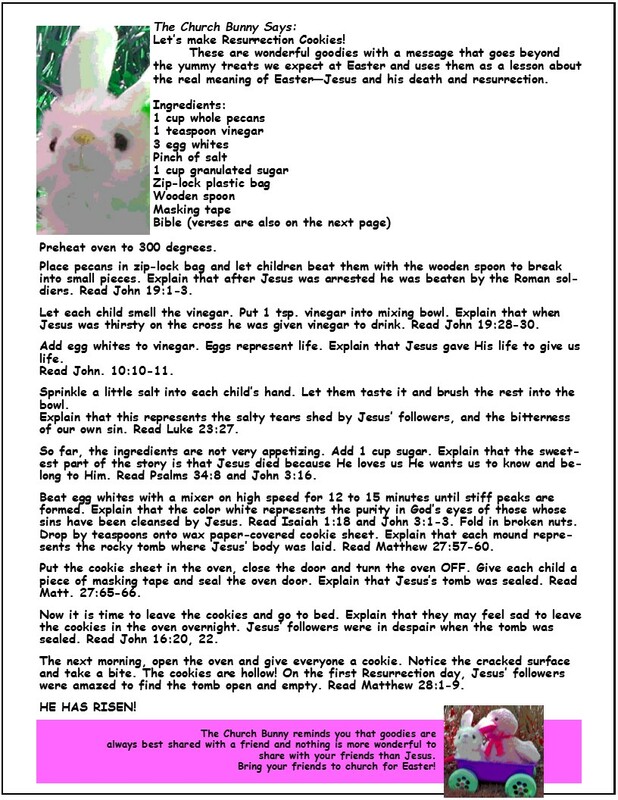 On the next page are the directions for making Resurrection Cookies and the Bible verses to read with them. 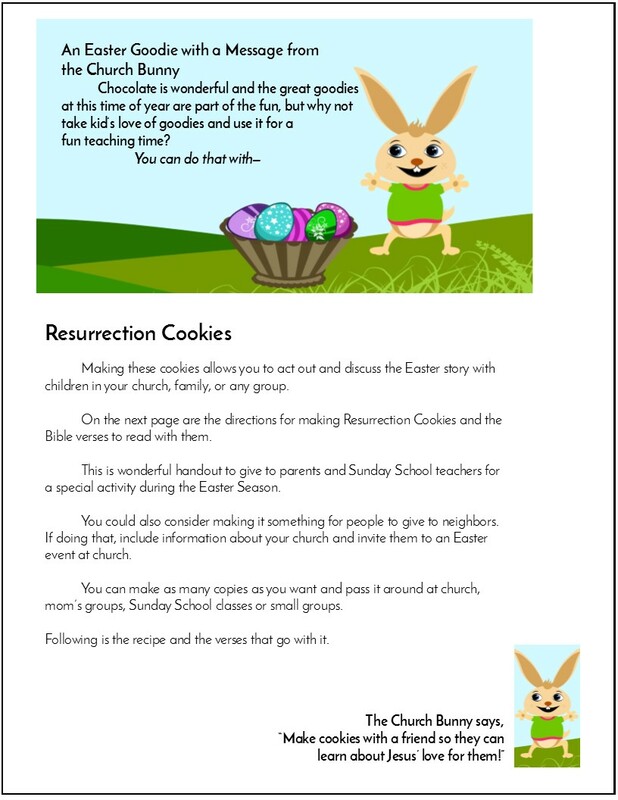 This is wonderful handout to give to parents and Sunday School teachers for a special activity during the Easter Season. You could also consider making it something for people to give to neighbors. If doing that, include information about your church and invite them to an Easter event at church. Sunday School classes or small groups. These are wonderful goodies with a message that goes beyond the yummy treats we expect at Easter and uses them as a lesson about the real meaning of Easter—Jesus and his death and resurrection. Place pecans in zip-lock bag and let children beat them with the wooden spoon to break into small pieces. Explain that after Jesus was arrested he was beaten by the Roman soldiers. Let each child smell the vinegar. Put 1 tsp. vinegar into mixing bowl. Explain that when Jesus was thirsty on the cross he was given vinegar to drink. Sprinkle a little salt into each child’s hand. Let them taste it and brush the rest into the bowl. Explain that this represents the salty tears shed by Jesus’ followers, and the bitterness of our own sin. So far, the ingredients are not very appetizing. Add 1 cup sugar. Explain that the sweetest part of the story is that Jesus died because He loves us He wants us to know and belong to Him. Read Psalms 34:8 and John 3:16. Beat egg whites with a mixer on high speed for 12 to 15 minutes until stiff peaks are formed. Explain that the color white represents the purity in God’s eyes of those whose sins have been cleansed by Jesus. Fold in broken nuts. Drop by teaspoons onto wax paper-covered cookie sheet. Explain that each mound represents the rocky tomb where Jesus’ body was laid. Put the cookie sheet in the oven, close the door and turn the oven OFF. Give each child a piece of masking tape and seal the oven door. Explain that Jesus’s tomb was sealed. Now it is time to leave the cookies and go to bed. Explain that they may feel sad to leave the cookies in the oven overnight. Jesus’ followers were in despair when the tomb was sealed. The next morning, open the oven and give everyone a cookie. Notice the cracked surface and take a bite. The cookies are hollow! On the first Resurrection day, Jesus’ followers were amazed to find the tomb open and empty. Read Matthew 28:1-9. John 19:1 Then Pilate therefore took Jesus, and scourged him. 2 And the soldiers platted a crown of thorns, and put it on his head, and they put on him a purple robe, 3 And said, Hail, King of the Jews! and they smote him with their hands. John 19:28After this, Jesus knowing that all things were now accomplished, that the scripture might be fulfilled, saith, I thirst. 29 Now there was set a vessel full of vinegar: and they filled a spunge with vinegar, and put it upon hyssop, and put it to his mouth. 30 When Jesus therefore had received the vinegar, he said, It is finished: and he bowed his head, and gave up the ghost. John 10:10The thief cometh not, but for to steal, and to kill, and to destroy: I am come that they might have life, and that they might have it more abundantly. 11 I am the good shepherd: the good shepherd giveth his life for the sheep. Luke 23:27 And there followed him a great company of people, and of women, which also bewailed and lamented him. Psalms 34:8O taste and see that the LORD is good: blessed is the man that trusteth in him. John 3:1 There was a man of the Pharisees, named Nicodemus, a ruler of the Jews: 2 The same came to Jesus by night, and said unto him, Rabbi, we know that thou art a teacher come from God: for no man can do these miracles that thou doest, except God be with him. 3 Jesus answered and said unto him, Verily, verily, I say unto thee, Except a man be born again, he cannot see the kingdom of God. Matthew 27:57 When the even was come, there came a rich man of Arimathaea, named Joseph, who also himself was Jesus’ disciple: 58 He went to Pilate, and begged the body of Jesus. Then Pilate commanded the body to be delivered. 59 And when Joseph had taken the body, he wrapped it in a clean linen cloth, 60 And laid it in his own new tomb, which he had hewn out in the rock: and he rolled a great stone to the door of the sepulchre, and departed. Matthew 27:65 Pilate said unto them, Ye have a watch: go your way, make it as sure as ye can. 66 So they went, and made the sepulchre sure, sealing the stone, and setting a watch. John 16: 20 Verily, verily, I say unto you, That ye shall weep and lament, but the world shall rejoice: and ye shall be sorrowful, but your sorrow shall be turned into joy. . . .22 And ye now therefore have sorrow: but I will see you again, and your heart shall rejoice, and your joy no man taketh from you. Matthew 28:1 In the end of the sabbath, as it began to dawn toward the first day of the week, came Mary Magdalene and the other Mary to see the sepulchre. And, behold, there was a great earthquake: for the angel of the Lord descended from heaven, and came and rolled back the stone from the door, and sat upon it. His countenance was like lightning, and his raiment white as snow: 4 And for fear of him the keepers did shake, and became as dead men. 5 And the angel answered and said unto the women, Fear not ye: for I know that ye seek Jesus, which was crucified. 6 He is not here: for he is risen, as he said. Come, see the place where the Lord lay. 7 And go quickly, and tell his disciples that he is risen from the dead; and, behold, he goeth before you into Galilee; there shall ye see him: lo, I have told you. 8 And they departed quickly from the sepulchre with fear and great joy; and did run to bring his disciples word. 9 And as they went to tell his disciples, behold, Jesus met them, saying, All hail. And they came and held him by the feet, and worshipped him.